Central Vacuum Loaders – Foremost Machine Builders, Inc.
Foremost manufactures central vacuum loaders and conveying receivers for the transportation of raw material pellets and reclaim material from a storage silo to a blender, from one process station to another, and/or to the final processing point. When your plant requirements demand high productivity on a continuous basis, you’ll find our series VF and VMF Vacuum Loader Packages will provide the dependable, efficient operation necessary to succeed in today’s competitive processing environment. 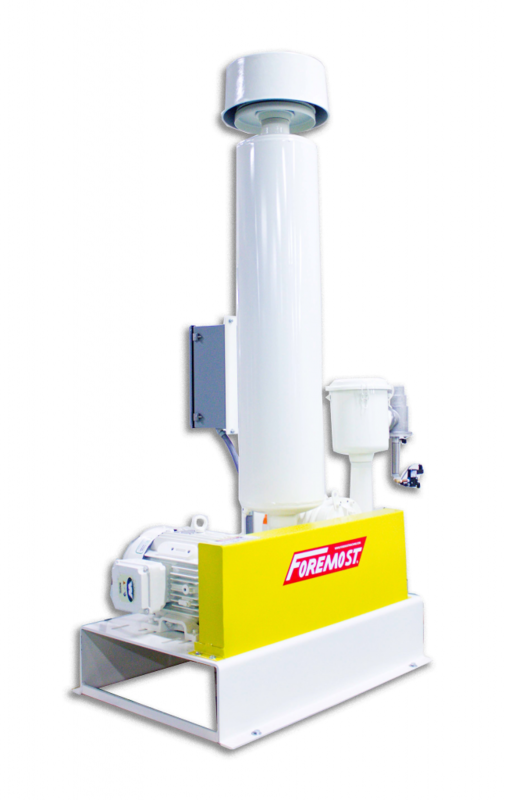 For over fifty years, Foremost has been engineering and manufacturing solutions to bulk material conveying problems. We have provided the highest quality equipment in our engineered systems and dependable vacuum loader packages. Our standard high quality components are matched with a conservative engineering factor to provide the end user with years of low cost, low maintenance productivity. The positive displacement pump creates a vacuum on the vacuum chamber, closing the flapper valve. The material is then drawn through the suction lance or from a vacuum-take-away box via tubing or flex hose to the vacuum chamber. The vacuum chamber can be loaded by either a timing cycle, which is easily adjusted at the control panel or by an end-point-control sensor mounted in the vacuum chamber. After the loading cycle, the vacuum breaks, causing the flapper valve to open and the material drops into the process hopper.